1910 Oakland Oaks Obak Baseball Card Print, relief with halftone, color, 1910. The Benjamin K. Edwards Collection; Library of Congress Prints and Photographs Division, Washington, D.C. Although the history of baseball begins in New York, much of its early development took place in the Far West. Baseball arrived with the Gold Rush in 1849 in the person of Alexander Cartwright, rapidly became a pastime enjoyed by many, and eventually led to the establishment of a Pacific Coast League. The Society of California Pioneers was pleased to present this fascinating if little known episode from the annals of history in From Empire State to Golden Gate: Alexander Cartwright and the Pacific Coast League. Alexander Joy Cartwright, the “father of baseball,” was born in New York City on April 17, 1820. He left school at age sixteen to become a bank clerk and was a member of the New York Knickerbockers Fire Fighting Brigade. As a member of the Brigade, Cartwright played town ball – an early version of baseball – on a vacant lot in Manhattan. In 1845, he co-founded the first team, the New York Knickerbocker Base Ball Club, in honor of his fire station and was appointed its secretary and vice-president. That same year, he wrote the first set of rules and regulations for the modern game of baseball. The first official game under Cartwright’s new rules took place on June 19, 1846 at the Elysian Fields in Hoboken between the Knickerbockers and the New York Baseball Club. The Knickerbockers lost convincingly by a final score of 23 to 1. On July 4, 1849, Cartwright arrived in San Francisco after a four-month overland journey, teaching baseball to others along the way. 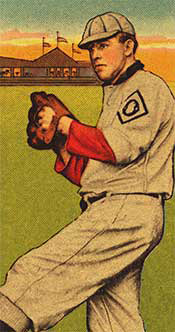 After overcoming a bout of dysentery, however, Cartwright abandoned his dreams of prospecting for gold and, instead, introduced the game of baseball to San Francisco. In August, he set sail for Honolulu where he laid out Hawaii’s first baseball field in Makiki and began teaching the game to the islanders. His efforts eventually led to the formation of several Hawaiian leagues and play with new ball clubs from Japan and China. As a consequence, the game was firmly established in both San Francisco and Honolulu well before it took hold in such traditional baseball cities as Chicago and Detroit. Cartwright also founded the Honolulu Fire Department, Queen’s Hospital and the Hawaii Library System. Cartwright died in Honolulu in 1898, but he must have cherished his time spent in San Francisco as he became a member of The Society of California Pioneers in 1875. Cartwright’s influence endured in San Francisco and other Knickerbockers such as William Wheaton, William Williams, Frank Turk and Alfred DeWitt, all SCP members, helped to establish and formalize the game in the city. There is little doubt they had a hand in the activities of February 4, 1851, when the San Francisco Alta Californian reported, “SPORT. A game of base ball was played upon the Plaza yesterday afternoon by a number of the sporting gentlemen about town.” Within eight years, the game had firmly entrenched itself in the city and on December 1859, the California Spirit of the Times and Fireman’s Journal printed a brief article referring to the formation of the San Francisco Base Ball Club, later known as the Eagles. The new club issued a formal challenge to any other “nine” for a game of base ball. The Red Rovers heartily accepted, and the first official game of baseball in San Francisco took place on February 22nd, 1860 at Center’s Bridge, now located at 17th and Bryant Streets. The rapid development of clubs throughout California led to the establishment of the Pacific Coast League in 1903, which spawned legends of the game such as Joe DiMaggio, Ted Williams, Tony Lazzeri and Ernie Lombardi. Baseball lured gifted players to the West Coast and San Francisco was host to many early stars of the game including Rube Levy, Hip Perrier and George Van Haltren. Music was written in their honor, photographs were taken, and postcards of the local stadiums were issued. Obak Base Ball cards were produced on Battery Street in San Francisco with witty texts written by students at the University of California. The game still flourishes in the Bay Area today and, like the Gold Rush, has become an essential component in the early history of California.